I did hot yoga this week. The only space remaining in the room was right under one of the heaters. After losing two stone in one hour and having to rearrange my body parts back to normal, I was starving. 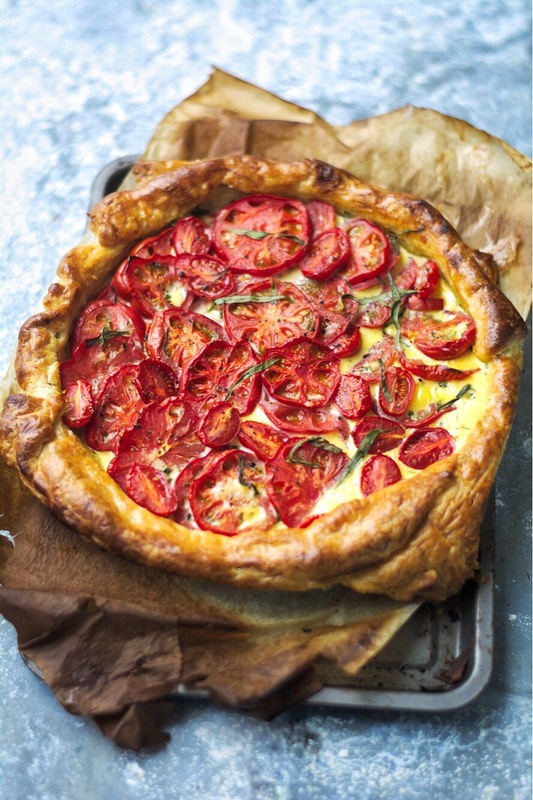 If I could summon the strength, I knew at home I had frozen puff pastry and a bowl full of beautiful, ripe tomatoes that were thinking about going on the turn if I left them lingering on the windowsill any longer. Like the banana bread I made for the children during the week, sometimes things that are just past their best are perfect to use in another way. And these tomatoes are a perfect example. They were lovely to start with, but slightly overripe, they were even lovelier, bursting and juicy, a deep, rich red inside. As always, if you have great ingredients, you have great food with hardly any effort. This works equally well with thyme, but I think tarragon is a much underused herb and in my opinion turns this dish from delicious to outstanding. Even if Bee didn’t quite think it was as amazing as I did. Grease a 19cm tart tin and line it with the pastry. Line and fill the case with baking beans or rice and bake blind at 200c for 15 minutes. Remove the beans and lining and prick the pastry all over with a fork. Brush the pastry with some of the egg all over the inside to seal it and and reduce the heat to 180c. Bake for another 10 minutes or so until golden. Slice the tomatoes and fill the case with them. Mix the eggs, cream and milk together until you have a thin batter, stir in the tarragon and season well. Pour into the tart case, give another twist of pepper and bake for about 40 minutes until set, but with a little wobble. You may need to turn the tart halfway through to bake the pastry evenly if you have a gas oven like I do. In any case, keep an eye on it. And make sure it’s level, otherwise it’ll set lopsidedly. Remove from the oven when cooked and leave to cool a little. It’s far superior when served warm, so is best made just before lunch.